We've manufactured the Kinetic Kracker Electric Pecan Cracker for years and each fall, we are bombarded with orders for this beloved cracker. 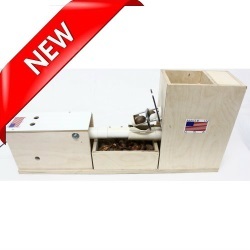 Delivering a perfect crack for each pecan regardless of type or size, this cracker has addressed the need for a fast and dependable electric pecan cracker for residential and small business needs. But over and over, customers have asked to consider creating a hopper for the cracker. Hoppers for pecan crackers-- not as easy as it may sound. Unlike the circular black walnuts (see the Drill Cracker), pecans are oblong-- creating lock jams and uneven cracks. We would work various concepts but each one fell short of the quality customers have come to expect from us. One day, a long-time customer contacted us with a concept design. He sent in the prototype and we saw potential! We brought in a team of engineers and machine fabricators and the Autocracker was born. Simple place your pecans into the one quart hopper and watch as the pecans slide into the carefully-engineered chute to be delivered precisely to the cracking cradle. The cracker fires the right amount of pressure to the end of the pecan for a cracker that results in pecan halves. Just as you could depend on the Kinetic Kracker to deliver the perfect crack to create pecan halves, the Autocracker delivers a sharp snap to the ends of the pecans. This annihilates the shell while leaving the nutmeat whole. Precision crack now available with the ease of a hopper. Autocrackers are due to ship mid-December. Already a Kinetic Kracker loyal customer? Call us for a special introductory offer!